In this difficult project environment, project organizations have been under a tremendous amount of pressure to cut costs. This pressure has translated into staff cuts and, in many cases, even the elimination of whole functions from owner organizations. Construction management is one function that, in many cases, owners have eliminated, based on the feeling that contractors are better poised to perform the role. However, Independent Project Analysis (IPA) research has repeatedly shown the importance of having an owner construction manager on the team early. There are several reasons to not rely solely on contractors to perform the construction manager role. All contracting involves a form of the “agency problem;” the agent’s (or contractor’s) incentives and goals will never perfectly match the owner’s. This is not due to ill-intent; it is simply a fact of life. Contractors answer to different stakeholders. Consequently, a contracted resource will never be able to provide input or execute a project with the same owner-driven considerations a company resource can. Additionally, to ensure constructability is appropriately considered early enough in the project, a project team requires construction management insights early in the project planning and development process. The construction manager is a member of the core team and, as such, is required when the team is formed during the scoping phase. However, when the function is performed solely by a contractor, project teams rarely get the early input they need. This leads to ineffective planning and, ultimately, degraded execution performance. Finally, the owner construction management role is fundamentally different from that of a contractor construction manager, especially on large projects. Instead of being involved in the day-to-day management of construction resources, materials, and equipment, the owner construction manager is responsible for managing the entire phase with the end goal in mind and communicating with all stakeholders. Recently, IPA has seen the Industry begin to reconsider their approach to construction management. Owners have begun to realize they cannot rely as much on contractors to effectively perform the role. So, as we now look to rebuild in-house competency in this function, we are faced with a major challenge—our old ways of hiring based on experience are no longer going to work in the wake of the demographic shift. So, how do we rebuild owner construction management in the absence of experience? IPA has launched a series of competency studies covering various project team functions in an effort to support our clients in strengthening their talent management systems—from hiring to assessing performance—by identifying the “softer” aspects of a person that support performance in their role. The first IPA competency study was unveiled early in 2016. The study, completed by IPA Senior Analysts David Purzer and Jon Walker, focused on the characteristics and leadership attributes of project managers. IPA’s second and latest competency study, introduced to the capital projects industry in March at Industry Benchmarking Consortium (IBC) 2017, examines the construction manager role. This timely research, led by IPA’s Organizations & Teams Product Champion Sarah Sparks and Associate Research Analyst Catherine Petrick, is based on surveys from over 250 Construction Managers across three key dimensions: experience, personality, and leadership style. Sparks and Petrick then linked attributes within each dimension to several success factors including safe project execution, predictable delivery (on-time, on-budget), and the effectiveness of the delivery (low cost, fast). On a small project, it is important for construction managers to be extroverted while on a large project higher levels of vigilance pay off. On small projects, being sociable is critical to effectively working and negotiating with stakeholders to get the resources required at the right time. However, on large projects, which are very sensitive to quickly spiraling out of control amidst problems, neuroticism is the most critical trait. People with higher levels of neuroticism are able to anticipate and plan for problems before they occur. 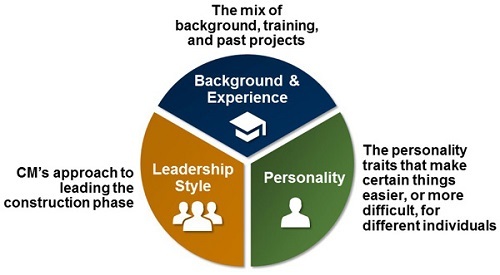 These findings show the need for Industry to improve the sophistication of their hiring, selection, and development processes to include attributes beyond just prior experience in a role. IPA’s research is conclusive in showing that a detailed understanding of a project team’s personnel combined with a clear understanding of the project and its priorities aids in selecting the individuals who are most likely to help projects succeed. Lastly, IPA would like thank all of the companies and construction managers who participated in the study. Without their willingness to provide us with detailed information about themselves, we could not have performed research that enabled us to quantitatively link individual characteristics with performance. To learn more, please visit IPA Organizations & Teams page.